During a trip to LA this weekend, I went to the Getty Museum. Like most people who go to the Getty, I used it as an opportunity to re-think and re-invigorate the way I'd like to plate desserts. I originally conceived of the idea with a modern art museum in mind, given the often abstract designs that desserts are presented in, but I try not to pass up chances to go to one of the most beautiful spots in LA. The white marble buildings and gardens of the Getty form a sort of campus that overlooks LA and the Pacific. So, my problem with many desserts is unnecessary adornment that is either impractical or trite. The star tip used in piping icing epitomizes this for me. It's the standard decoration for a cake that looks silly without being especially charming. Because so much frosting is used, it's usually a mediocre frosting that nonetheless piles itself up on cakes' borders so that it can leech itself onto all-too-much-suspecting victims. The increased surface area of the ridged icing means that more will be dried out. So much of this stuff is scraped aside by cake eaters. And on the other hand, desserts presented with random splotches of color or lines also make me question their relevance to the situation at hand. I think that dessert design should, of course, be fun (that's what desserts are all about), but also use a bit of form and function logic. Rather than relying on worn out designs, it's more interesting for the pasty chef to adapt the design for the individual dessert and its intended effect, like a Frank Lloyd Wright or Maury Rubin approach. Okay. It turns out that even paintings have their form of star tip absurdity. I guess humans like to frame artistic creations with bold lines. 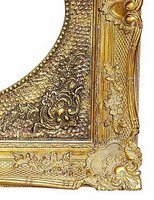 Like a frame is needed to hold a painting, an icing border is used to cover the corners and layers of a cake. Fair enough. But why not explore a larger variety of designs? That's all I'm asking. In other news, I liked applying the ideas of using color on the entire canvas and creating perspective on flat surfaces. That can be worked into desserts. The decorative arts wing also offered new ideas on the depths and colors and designs that make up a whole three dimensional piece of art. Anyway, it was a fun new way to go through a museum, and I think I will also try a modern art museum.... There are, after all, way fewer frames there. The comparison of ostentatious frameing to the overdoing icing was brilliant! I esp like the presentation here. Well done. Best of luck in your pursuit of the perfect look for your desserts. Thanks :) At some point during the class, we're going to have to learn how to decorate such things, but I wish that the Chef Instructors would buy my ideological opposition and just let me skip it. I'll probably have to resort to sabatoging it from within instead. Why is the Microwave faster than the Oven?